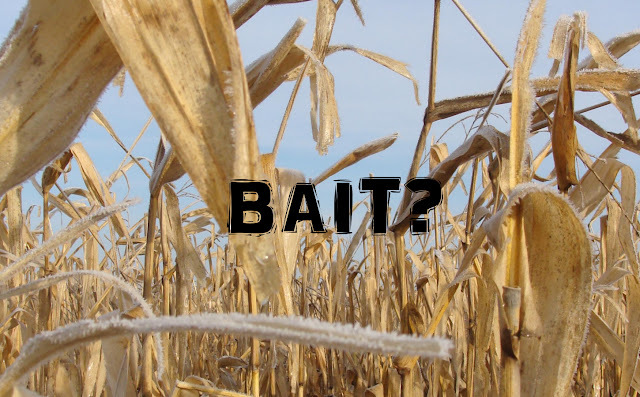 Baiting: What really is it? ﻿Baiting. The ever so controversial subject. To bait or not to bait. Pros vs. Cons. The image it creates. The reducing of "fair chase." But, if you break it down, what really is baiting? This subject has been talked about and beaten up for decades. In Minnesota the baiting of deer was banned in 1991. Since then the subject remains in the discussions amongst most outdoorsman. This subject is viewed upon in many ways. I think for most, when they think of baiting they think of a large pile of corn in the woods. That's a pretty fair assumption. I would like to touch base on, what really is baiting? Out of season baiting doesn't carry the same controversy, so I want to really focus on in season baiting. All B.S. aside, what is the main point, for most, of baiting? To lure game into range. That is the sole purpose of bait. The definition of bait is any substance, especially food, used in catching fish, or other animals, by alluring them to a hook, snare, trap, or net. I think this opens up, no pun intended, a whole new can of worms. I think "what" baiting is has been the true controversy. So, a tree stand can be placed over a pile of corn left by a grain wagon, but not over a pile of corn left by a plastic bucket? Isn't the intent the same? That pile of corn from the grain wagon was not placed there naturally, people put it there. Maybe the controversy should be over how what bait got where. Food plots are huge now days. They are considered under Minnesota regulations as wildlife food plantings and are completely legal. Personally, I think food plots are great. Not only do they provide food they also provide wildlife habitat. So, we can plant specific types of plants that wildlife are attracted to in any location we prefer. Realistically, by definition, isn't that baiting? We have unnaturally placed a food source with the intent on luring game into range, right? As long as the corn is still on the stock and not on the ground it's ok? If I picked out a spot and instead of dumping a bucket of corn I planted 5 turnip plants there and shot a deer feeding on them, that's ok? Minnesota regulations also state that no person my hunt in the vicinity of bait or feed if the hunter knows about or has reason to know about the placement of the bait of feed. If I hunt a property and the farming landowner puts out pheasant feeders that attract deer, I can't hunt there because I know of them and I may shoot a deer on its way to one of the pheasant feeders? Bird feeders are another issue. Lots of landowner that live on the properties have bird feeders. Late in the season these bird feeders can really attract the deer. If we know about them, we can't hunt these properties? This is one of those issues that is hard to draw a line on. Hence the controversy. Another example is using scents. Scents are perfectly legal and have been used for, well, as long as hunting has been around. If I place a small rag in a bush that is soaked in acorn sent or even a sexual attractant, it's perfectly fine. Nobody seems to frown on that. Again, isn't the intent the same? To lure game into range. It's even called a lure. Get what I'm saying here? I've even heard of guys using plastic apples and plastic ears of corn paired with sent and shooting deer over them. That's fine though. Not sure I see the difference. Sure, the deer wont eat the plastic, but if they were real wouldn't that be more beneficial to the animals? You can go into a numerous number of stores and see isles of mineral products for deer, but you can't use them to hunt over. You can use them out of season and if you use them in season you have to remove them and let the area sit for 10 days before it is a legal hunting site. I'm talking about products such as AcornRage and many alike products. You can use mineral product like this to hunt over as long as they don't contain any grain, fruit, etc. These products are designed to benefit the overall health of the animals. The proteins and immune system minerals support overall health. But, they might attract a deer that we may want to shoot, so no, illegal. If you use such minerals without an attractant such as VitaRack it's ok. What the? The additive grain in these minerals is used as a lure to attract deer to the beneficial minerals. Grain additives or not, the deer will find them. When they do, if no grain additives are present, you can take the shot? Legally we can use products like the TrophyRock and VitaRack, but not AcornRage and BuckBran. They are both lures and have proven benefits to deer. I constantly hear people comparing bear bait and deer baiting. They say, " If you can bait bear why not deer? What's the difference?" I agree and disagree with this as well. I archery hunt both deer and bear very seriously. I can say that if there was no bear baiting harvest numbers would plummet. Making population management near impossible. Often, I hear the reasoning for this being that a bear is far more nocturnal. I've been chasing mature bucks in Minnesota for a lot of years now and I don't know of a more nocturnal animal than a mature Minnesota buck. 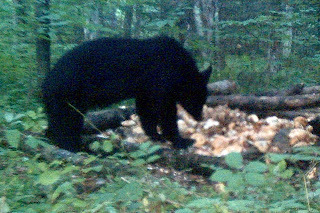 I've seen more bear at 4:00 in the afternoon than I have shooter bucks at 4:00 in the afternoon in Minnesota. Baiting is no sure thing either. Animals are more wary coming into any kind of a bait station. That bear knows those doughnuts didn't grow there. As far as comparisons go, what about fishing then? We all have put bait on a hook to catch a fish. I'm not picking sides by any means. Simply, opening eyes and perhaps putting a new spin on the subject. I have agreements and disagreements for both sides. In the end, we all only have so many tags. Bait or no bait, you can't simply keep shooting. If a person wants to fill his tag with a deer standing over a bucket of corn or to shoot a deer standing in a cornfield it should be their personal choice. Overall, if something is beneficial to wildlife, in my opinion, if used properly, I'm all for it. Having family and friends sit over a 100 pounds of corn shooting deer till all tags are filled isn't really my bag. Shooting a mature buck eating AcornRage, filled with proteins and minerals, with an arrow, I can definitely see that. It is personal interpretation and really, what is the difference? It's all about the intent.